Given my trip to Chicago and the hectic nature of the holidays, I don't have any new photos to post of my knitting projects. I have been knitting but nothing is at an interesting enough point to post photos. 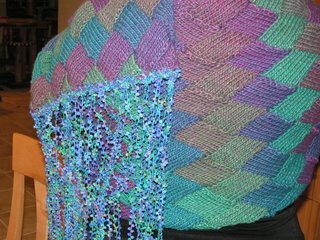 So here is a photo of the Lady Elanor shawl I made for my Mom last Christmas. Since I didn't have a blog at that time I never posted a photo so I thought I would share it with you this holiday. It is made out of Karoke soy silk and it was very fun to knit but it took me 2 months. This year nothing quite so ambitious for holiday knitting. Sorry Mom! Wow, Allison. How beautiful. I still haven't tried entrelac. Soon, very soon. Amazing shawl, Allison. I bet your mom loved it!! I love the look of entrelac.... still a little afraid to try it. You did a gorgeous job! I adore that colourway!!!! 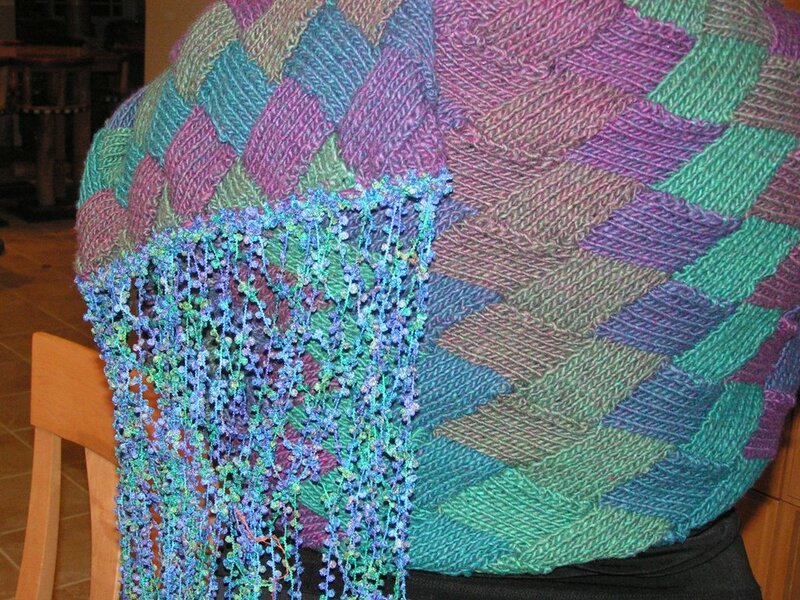 Gorgeous, and I commend you for making such an amazing shawl! Howdy!! Long time no blog to!! Love the posts, the purse is cute. Have you read "Knitting for Peace" - i got it last night at Barns & Noble - check it out. Have a great holiday!! I am tagging you, I hope you don't mind. You can find the rules on my blog. And the shawl is beautiful. Does the karaoke soften up some with blocking? Sorry, but just had to tag you :-) Check my blog!! Happy knitting! I would have tagged you but you are a popular target! lol.